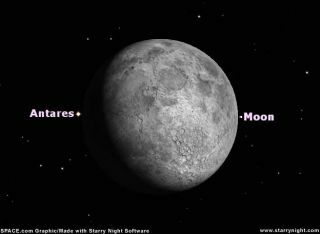 The Moon and Antares as they will appear from Los Angeles at 8:10 p.m. on July 17. Viewer's in other locations will see a different setup. On the night of July 17-18, for the third and final time this year, North American observers will have an opportunity to watch the Moon cross in front of the bright red star Antares, an event called called an occultation. Previously, the Moon hid Antares on March 3 and May 24. After this event, the Moon will continue to cross paths with Antares on a monthly basis until February 2010. But many of these upcoming Antares occultations will favor localities south of the equator. Not until June 2009, will most North Americans get another opportunity to watch the Moon hide Antares. But even in this upcoming case, much of North America is outside the occultation zone. The regions that will see Antares pass behind the Moon include parts of the Pacific Northwest, California, the Southern Rocky Mountains, Southwest Desert, Central and Southern Texas, the Gulf Coastal States, Florida, and parts of the Piedmont and Southeast Coast. The rest of the United States and Canada will be able to watch as the Moon slips just below Antares; coming tantalizingly close, but not obscuring it. The Moon will be a waxing gibbous on the night of the occultation, with 85 percent of its disk illuminated. Those within the occultation zone will see Antares wink-out on the dark, unilluminated part of the Moon's disk and popping back into view on the Moon's bright side. The Moon's overall brightness will probably overwhelm Antares as it gets close to the Moon's edge. So although it ranks as the fifteenth brightest star in the sky, you will likely need a small telescope or at the very least binoculars to follow it first into the Moon's dark limb and then back out from the bright lunar limb a short while later. Those who are positioned within about a mile or two of the northern limit of the occultation zone, will be treated to a spectacular grazing occultation occurring along the Moon's dark limb. There will be a bonus in that both the fiery-red Antares as well as its hard-to-see "wily" 5th-magnitude companion star may appear to repeatedly vanish and reappear along the rugged lunar landscape. Places that are just a short driving distance from the graze line include Elko, Nevada; Bernalillo, New Mexico; Lubbock, Texas; Shreveport, Louisiana; Vicksburg and Jackson, Mississippi, and Fayetteville and Elizabeth City, North Carolina. For more detailed predictions on the where the graze line is located, go to the International Occultation Timing Association's (IOTA) Web site, and check the "Time Critical Events" section. In the table below, we provide a timetable for six selected locations, giving the local times and the Moon's altitude for both Antares' disappearance and reappearance. When a time is listed as p.m., it is for Sunday night, July 17. If a time is listed as a.m., it is for Monday morning, July 18. A single asterisk (*) means the event occurs during evening twilight. A double asterisk (**) means the event occurs before sunset. Nonetheless, if the sky is clear with no significant haze, you should be able to see the Moon low in the south-southeast sky and be able to discern Antares with a small telescope. This information is based on predictions by IOTA and has been rounded off to the nearest minute. As previously noted, for the rest of North America, this will be a very close approach of the Moon to Antares (called a conjunction). The Moon, moving around the Earth in an easterly direction at roughly it's own diameter each hour will seem to creep slowly toward and ultimately pass just below the ruddy star. Even though much of North America will miss out on the occultation, it will still be most interesting to watch with binoculars or a small telescope to see how closely Antares will appear to glide just above the Moon. After closest approach, the Moon will move slowly away from Antares, with the Moon setting not long thereafter for eastern locations. Most of the United States and Canada will be in darkness, or twilight at the moment that Moon and Antares are closest together. A single asterisk (*) indicates that evening twilight is still in progress. A double asterisk (**) indicates that the closest approach occurs just before sunset. In most cases, the distance separating Antares from the Moon's upper limb will be 0.05 degrees or less. To gauge just how small this is, consider that on the night of the occultation, the apparent width of the Moon will be equal to 0.54 degrees. So, as seen from Denver, the distance separating Antares from the Moon's rim will be equal to roughly 1/11 of the Moon's diameter. And for places where the separation is listed as 0.01 degrees, the miss distance will be equal to just 1/54 of the Moon's diameter!